Fabulous turquoise and onyx necklace made with large barrel beads lovingly crafted with round black onyx and faceted black crystals to create a stunning elegant necklace. Distinctive gorgeous and breathtaking. An ideal gift. Black onyx is dyed microcrystaline quartz, that is naturally brown or grey when mined. The stones are highly polished, heat treated and dyed to enhance their appearance. 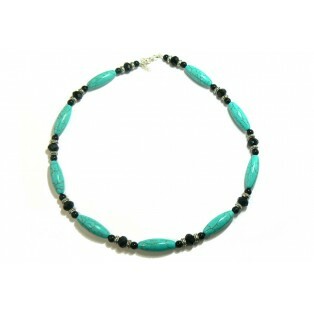 This turquoise and onyx necklace measures 18 inches long. I have added Tibetan Silver spacer beads that resemble tractor tyres between the onyx and the faceted crystals to enhance the design. I have fitted a silver plated "nickel free" clasp and extension chain, to comply with EU directives.